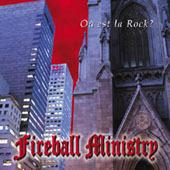 Fireball Ministry is a rock band. The group consists of James A. Rota (guitar/vocals), Emily Burton (guitar), John Oreshnick (drums), and Johny Chow (bass). Conceived in Cincinnati in the late 90's by Rota and Burton, the band moved to NYC before settling in Los Angeles. 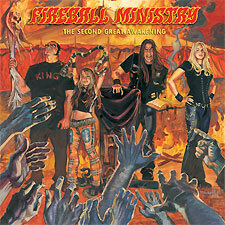 After several years appearing with various big name bands in the genre (Danzig, Anthrax, Motorhead, Slayer) but without a breakthrough in sales they have found their own sound and are fast gaining a wider following. The selection of the track "King" by the increasingly influential Bam Margera on his Viva La Bands compilation appears to have sealed the Ministry's asendancy to the big time. In addition, the track "The Broken" was included in the WWE video game SmackDown vs. Raw 2006 for the Sony PlayStation2, further expanding the band's audience.